Join us for mountaineering expeditions to some of the world's most exciting peaks, including Mt Everest, the 7 Summits AND MORE. Join us for trekking to Everest Base Camp, Annapurna Base Camp, Ama Dablam Base Camp, and on the Manaslu or Annapurna Circuits or to Upper Mustang in Nepal AND MORE. Learn from UIAGM / IFMGA qualified and other experienced guides. Come and join Expedition Base and learn mountain skills in a supportive environment with a highly skilled team. With Expedition Base you can trek, climb and learn in some of the most enjoyable, exotic and awe inspiring locations in the world, including Nepal, Tanzania, Tibet (China), Argentina AND MORE. 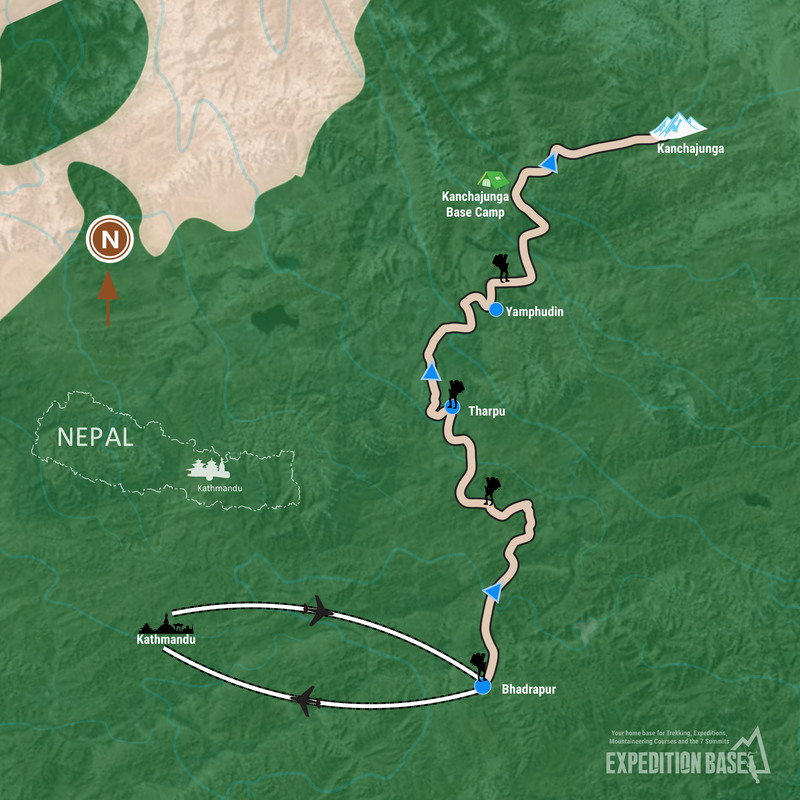 Expedition Base is about safety, responsibility and fun in the mountains – whether trekking, climbing, ice climbing or participating in a course, if you decide to join Expedition Base as a client, you know you are joining a great and dedicated team. In far eastern Nepal, away from the crowds surrounding Mt Everest, lies an understated Himalayan giant: Kanchenjunga, the 3rd highest mountain in the world and 2nd highest in Nepal. Sitting on the border between Nepal and India (Sikkim), Kanchenjunga is an awe inspiring challenging mountain with five summit peaks, hence the meaning of Kanchenjunga ‘the five treasures of the great snows’. 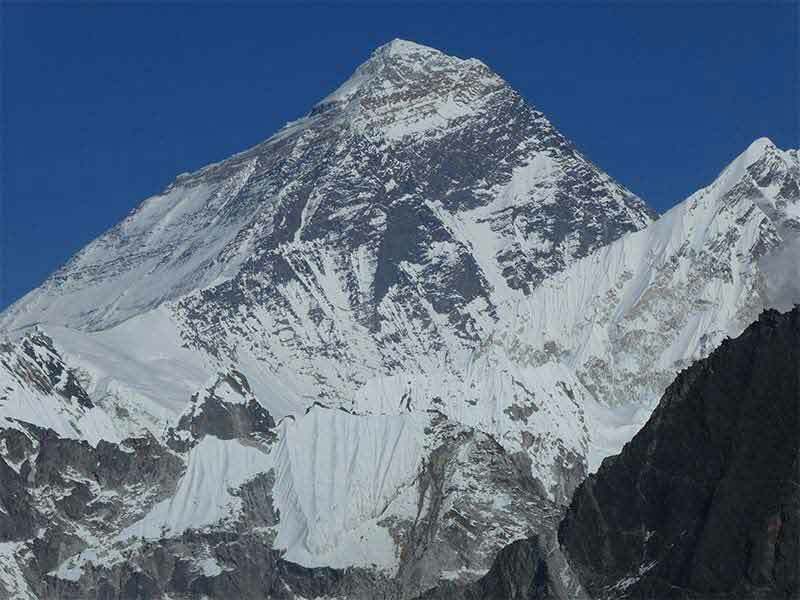 Four of the five summits are above 8,000m: main (8,586m), west (8,505m), central (8,482m) and south (8,494m). 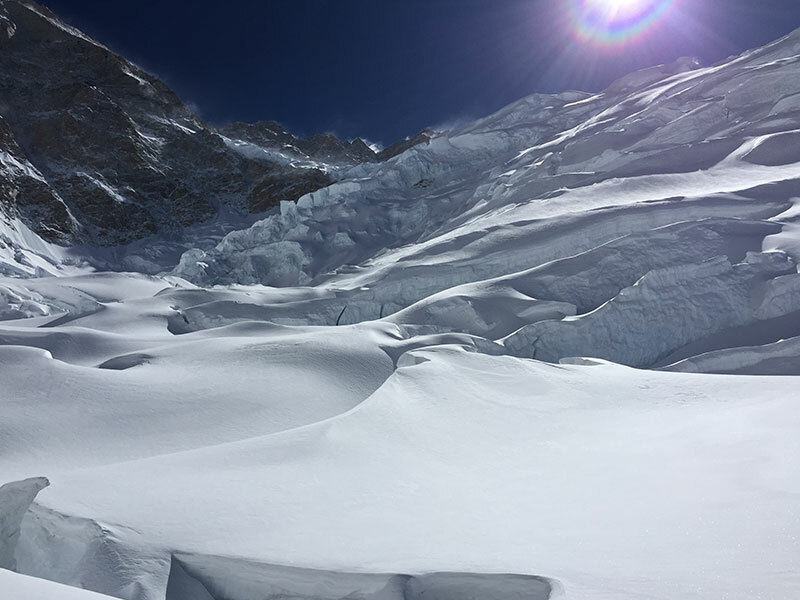 In April 2018, Expedition Base plans to lead an expedition on Kanchenjunga to the main summit from the Southwest face. The trek to base camp on the Yalung glacier is remote and largely unsupported by teahouses, therefore a good deal of the route is camping. From base camp, we will rotate through 4 camps up to the summit. The route is technical including a steep ice wall climb above 8,000m. This expedition is recommended for climbers with prior experience of 8000m mountains, with good endurance and a desire to join one of the most prepared, strategic thinking, success and safety minded teams on the mountain. Why join with Expedition Base? When it comes to mountaineering expeditions, for any peak, we are known for our sound strategy, strong leadership and well-resourced approach to our expeditions. The mountains are fun and full of wonderful experiences. But, we also recognise that they also carry with them risk. For that reason, we approach the mountains on the basis of ‘safety first’. With safety as our first focus, fun and amazing experiences will follow. Few companies offer logistics as good as ours for a reasonable price point. Our goal is to put our clients in the best position for success, whatever their personal goal in the mountains may be. Our guides are some of the best in the business, with experience on a wide range of peaks from small, right up to the 8,000m peaks, many with multiple summits on the 8,000m peaks. We see strong leadership as critical to success on the world’s highest peaks and we can offer that leadership here at Expedition Base – and not all companies can. We offer the level of services historically offered by leading western companies, but without costly western overheads. In the mountains, your safety is our prime importance. We know our clients value our commitment to them and with that flows a great experience. Want to make it a private trip ? This trip is for experienced mountaineers. 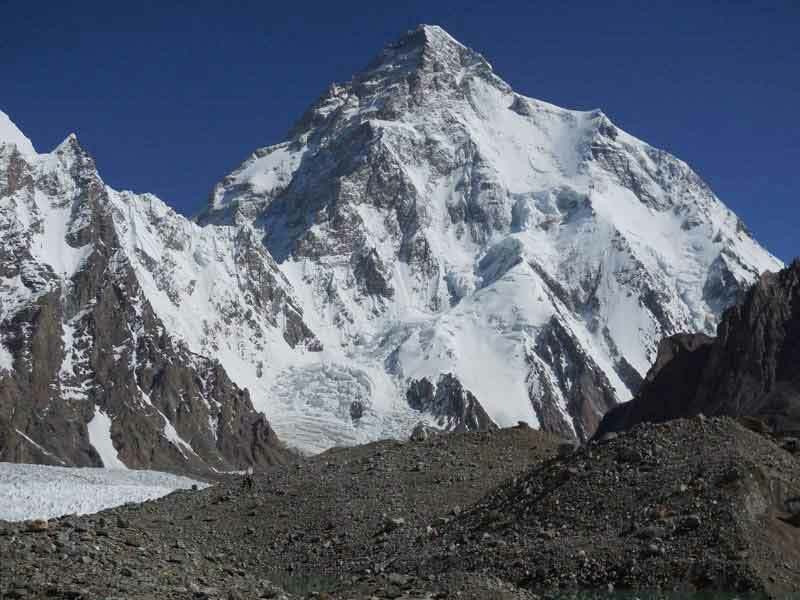 The trip will involve challenging trekking, advanced mountaineering, moving on snow, rock and ice, with technical tools, at reasonably high altitudes up to around 8,848m, depending on the mountain. You can expect to experience some serious heights, some ledges, and exposure to steep terrain. For this trip, you want to have an advanced level of fitness, with cardiovascular exercise and own- body weight type exercises (or similar) at least 4-5 times per week for the period of around 6-12 months before this trip, building on your already sound fitness. Weight training is also strongly recommended. Training on uneven terrain is strongly recommended. By registering for this trip, you likely already know what you need to do but wherever we can help, we will. View the printable version of the short itinerary and detailed trip notes here. Note: Daily walking hours include a lunch break, and regular rest breaks. camp (including personal tent, heated dining tent and communication tent, full satellite communication system (pay per use), all meals/snacks and hot showers), 2-way radio system for guides to communicate between camps, team of climbing guides to set up and stock higher camps, climbing guides to assist to carry personal gear to higher camps, all meals and tents above base camp, minimum 1:2 guide: client ratio on summit day, O2 allowance with quality delivery system, high altitude wilderness first aid kit, transport of group equipment to base camp, all group climbing equipment supplied, all other charges for route setting and two complimentary expedition duffels for client to use and keep. International flights to and from Kathmandu, tips and summit bonuses for climbing guides, tourist visa fees, meals in Kathmandu (allow USD $10-15 per meal), aerated and alcoholic beverages, personal items (e.g. phone calls, laundry, internet), personal transport in and around Kathmandu, travel insurance (including early departure and mountain search/rescue) and personal climbing gear, helicopter flights (at client option). No matter what the enquiry, our commitment to exceptional service ensures that a helpful and knowledgeable staff member is on hand to assist you whenever the need arises. Copyright © 2018 Expedition Base. All rights reserved. Website by Curves n'Colors.